Hockey legend, Wayne Gretzky, is known for saying that he “skated to where the puck was going to be.” I’m feeling a bit like that right now with the Career Engagement model that Deirdre Pickerell and I co-developed in 2011. 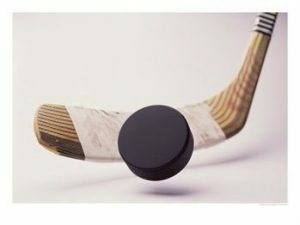 Although the model immediately resonated with people back then, and we’ve since conducted research and written and spoken internationally about Career Engagement, it seems that in the past few months “the puck has arrived” and we’re well positioned to do something significant with it. Within the Career Engagement model, we have conceptualized maximum engagement to occur at the intersection of challenge and capacity. Too much challenge for the available capacity can be overwhelming; too little challenge, on the other hand, leaves people feeling underutilized. Being excessively overwhelmed or chronically underutilized is the path to disengagement. One of the distinguishing features of the Career Engagement model is how we have conceptualized capacity as being both individual and organizational (or contextual). Models with similar components, such as Csikszentmihalyi’s Flow (1990), focus exclusively on matching individual characteristics to challenges. 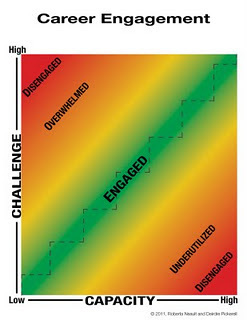 In developing the Career Engagement model, we wanted something that acknowledged that not all causes of disengagement lie solely within the individual – one might possess all of the competencies to perfectly fulfill a role, but if a key piece of equipment breaks down, the project budget is significantly cut, or key team members don’t show up for work, a job that was previously engaging can suddenly become overwhelming; in such a case, it was organizational or institutional, not individual, capacity that diminished. There would be two ways to become re-engaged: replenish capacity or reduce the challenge. I’ve had the privilege this year of doing very interesting work in the Middle East (training career counsellors), Korea (serving on Team Canada), Atlantic Canada (building a competency framework to support school-to-work transitions), and Mexico (serving on a panel exploring the relevance of theory to professionalism). In each of these diverse places and projects, a common theme has emerged – the importance of attending to context. It is becoming recognized globally that we need to stop working in silos – career practitioners and guidance counsellors, who have traditionally focussed on individual characteristics in career planning and decision-making, need to better integrate “the supply side” (the individuals we support) with “the demand side” (the employers who hire them). This is a paradigm shift – for many years, career practitioners and human resource (HR) professionals have worked quite separately. Increasingly, and worldwide, there is recognition that neither side can function effectively alone. We need each other. Our integrated supports, shared insights, and co-constructed knowledge can benefit both individuals and organizations, ultimately impacting the global economy. Interestingly, this is what we set out to do back in 2011 with the Career Engagement model. Informed by literature in the social sciences, education, and business and applied in settings from schools and community programs to corporate headquarters, the Career Engagement model bridges silos – it always has. What’s different now, is that individuals in schools, governments, and corporations are recognizing that they need a tool like this. Back to the original Gretzky metaphor, the puck has arrived. And we’re ready! We’ve been invited to present on Career Engagement in Europe next year, with a focus on teacher and student engagement. We’ve been approved to conduct research within a post-secondary setting on faculty, staff, and student engagement in an e-learning environment. We’re contemplating extending the model to look at engagement of high school students, foreign-trained professionals, and retirees. The applications seem endless when one defines career broadly as encompassing a variety of significant life roles. If you’re interested in learning more, or participating in upcoming research on the model, please reach out to us at info@lifestrategies.ca. A few resources are listed below as a starting place.